In the context of this hiking tour, Rumiñahui is the name of a extinct volcano and the central piece of this tour. However, Rumiñahui is the name of a brave Inca general who led the resistance against the Spanish conquistadors after they executed the emperor Atahualpa in Cajamarca (Peru) in 1533. In order to take part in this hiking tour you should acclimatize in Quito (~ 3900 meters above sea level, masl) or other similar high place for at least two days. Ecuador Tierra Viva's Rumiñahui Hiking Tour starts and ends in Quito. We'll meet the group at the main entrance of 'El Jardin' Shopping Mall at 8:00 AM. Once the group is assembled we'll board a vehicle and make our way to the town of Panzaleo. This town is located about 1.5 hours south of Quito. Our hike starts at 3,760 meters above sea level (masl) on a road located very near the crater of the extinct Rumiñahui volcano. This volcano exploded a long time ago leaving behind a big crater and three main peaks, namely the Northern, Central and Southern Rumiñahui. We will hike up a trail that goes through farm land. After about an hour, we'll reach the 'paramo' of the Cotopaxi National Park. The paramo is a very important Andean grassy ecosystem that plays a key role in water conservation. Following the trail we'll eventually reach a plateau that shelters a Polylepis forest. Polylepis is a shrub-like tree native to mid and high elevation regions of the Andes Mountains. We'll continue hiking until we reach the base of the Southern Rumiñahui, which is found at 4,200 masl. At this base we'll find a protected flat ground where we'll set up our base camp and have lunch. After a short break we'll start our ascend to the summit of the Southern Rumiñahui peak. We'll hike over some sandy terrain and scree slopes in order to reach the peak's summit, which is found at 4,696 masl. After enjoying the stunning view, we'll make our way down to our base camp. Supper will be served at 5:30 PM and after this, we'll just relax and enjoy the night sky. Today wake up time will be at 7:30 AM. Several snowcapped mountain peaks will greet us in the morning including the Cotopaxi and the Illinizas (North and South). After breakfast (8:00 AM) we'll hike over Loma Gorda hill (4,286 masl) and descend through the valley that is found between the Southern and Central Ruminahui. 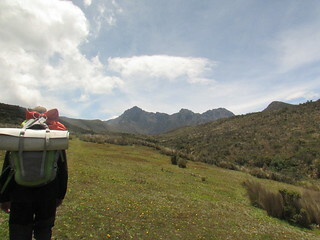 Next we'll hike along the Santo Domingo crest and then descend towards the Limpiopungo Lagoon. We'll rest at this pretty lagoon before we make our way to the nearby parking lot. Here our vehicle will be waiting to take us back to Quito. On our way to Quito, we'll make a brief stop at Cafe de la Vaca to have lunch. We'll be back in Quito by 4:00 PM. Meals Three meals (Day1:lunch-box and dinner; Day 2: breakfast) and snacks. Non-alcoholic beverages and water will be provided. Tour does not include Travel, medical or accident insurance; personal expenses; tips; lunch on Day 2. Cancellation Policy No penalty: cancellations done at least one week before the start of the tour. 50% reimbursement: cancellations done more that 24 before the start of the tour. No reimbursement: cancellations done 24 hours or less before the start of the tour.